The Regency Society has produced a set of three pamphlets on the subject of commemorative plaques, each of which I hope to summarise over the next few months. ‘Plaque Trails’ for Hove, central Brighton and Kemp Town have been drawn up and this week I look specifically at the suggested route through Hove. There are said to be a total of 103 plaques around Brighton & Hove; 71 in Brighton and 32 in Hove. Commemorative plaques are often called ‘blue plaques’ but this can be misleading. Official English Heritage plaques around London, and more recently Liverpool, Birmingham and other cities, certainly are blue but Brighton & Hove has many different shapes, materials and colours from a variety of organisations including the Rotary Club, the British Film Institute and the Regency Society, dedicated to both people and buildings. We are even fortunate enough to have two pronunciations of the word plaque – both ‘plack’ and ‘plark’ seem to work fine in all social circles here! The Hove trail consists of fourteen plaques and starts at 12 First Avenue where novelist and playwright Patrick Hamilton (1904-1962) lived as a child. Along the seafront, 42 Brunswick Terrace commemorates Prince Clemens Metternich (1773-1859), the Chancellor of Austria. The third stop, 16 Lansdowne Place is dedicated to John Leech (1817-1864), the humorous friend of Charles Dickens. Back to the seafront for plaques at 53, 45, 33, 17, 4 and 2 Brunswick Square that are for the Dunbar Nasmith Home, Edward Carpenter (1844-1929), Sir Hamilton Harty (1870-1941), Robert Bevan (1865-1925), Sir Roger Quilter (1877-1953) and Sir George Augustus Westphal (1785-1875) respectively. 15 Brunswick Terrace has a plaque dedicated to J. H. Round (1854-1928), the distinguished historian. 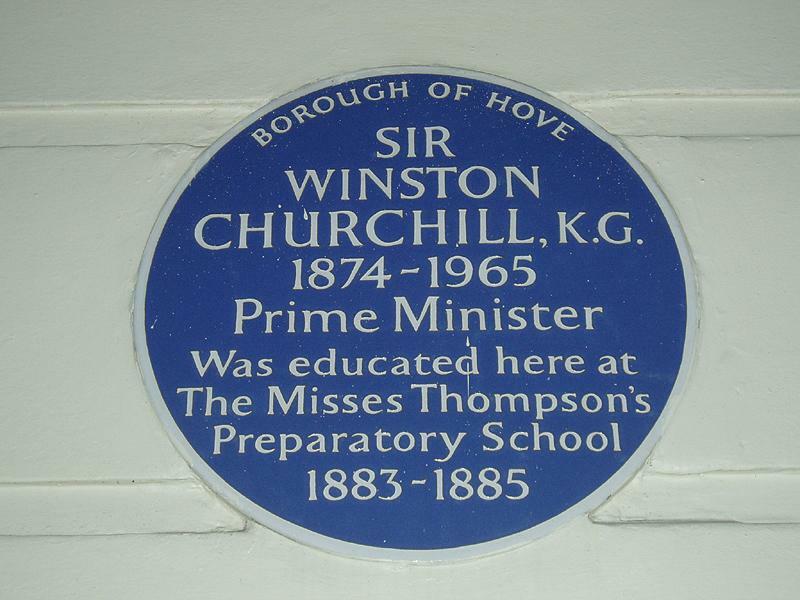 My idol, Sir Winston Churchill (1874-1965), has two plaques on 29/30 Brunswick Road, his prep school. Interestingly, the names of the owners of the school are wrong as are the dates that he attended. Finally, 14 & 13 Palmeira Avenue commemorate Victoria Lidiard (1889-1992), the women’s rights campaigner and Sir Jack Hobbs (1882-1963), the cricketer, respectively. I should point out that most of the research for this piece comes from the Plaque Trail pamphlets by Duncan McNeill and a comprehensive report on the City’s plaques by Eileen Hollingdale, both from the Regency Society. I am very grateful to the two of you. Whether you say ‘plack’ or ‘plark’, you’d be absolutely insane not to check out one of these short tours!